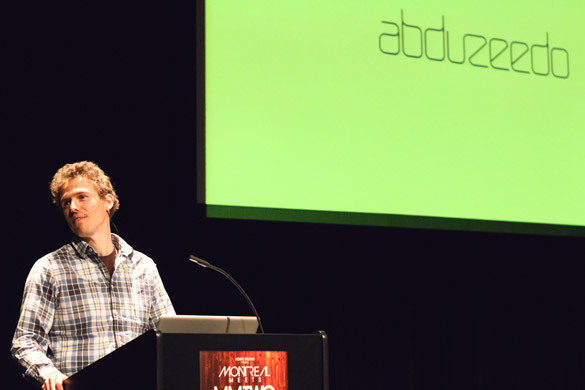 Gettin' down to business at Montreal Meets 2. Photo by Tina Mailhot-Roberge. One good lookin' crowd. 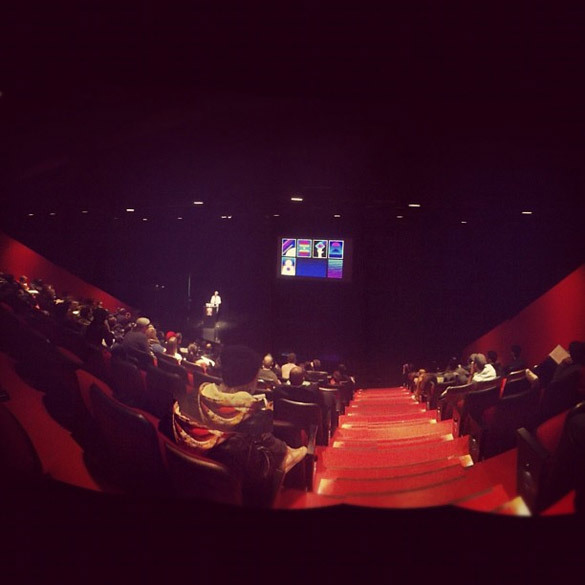 That noisy white spec onstage is me. Photo by Steve Schiavello. 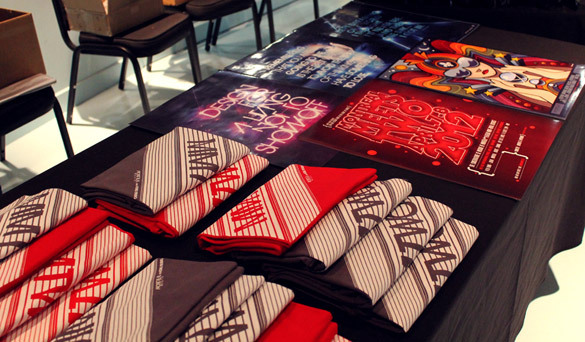 The spirited MMTWO merch table. Lots of colour. Fabio Sasso telling his story from Abduzeedo to Google. The mighty Radim Malinic setting the record straight. The MMTWO question period, way more fun then we look. Check Rik out, ready for war! The man behind MMTWO. One and only Francois Hoang. Shelby White spreading some wise thoughts, theories and stories. Rik Oostenbroek takes us through his entire creative journey. Laughs included. Where to begin? 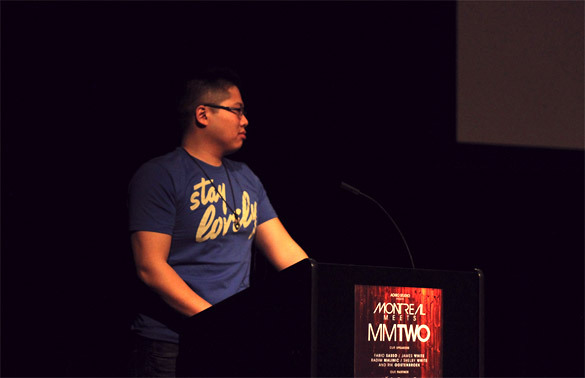 I just returned from my trip to Montreal for the anticipated MMTWO event where I debuted my new talk, DESIGN RENEGADE. Amazing weekend voyage that flew by far too quickly. Many laughs had, many hands shook, many friends made. Lasting memories of great conversation, seedy remarks, general joshin’, poop jokes, deep thoughts and all the rest. What better way to recap then a machine-gun list of moments. Lets do this. 1. McKibbon’s Irish Pub gathering, minus one unfortunate Radim Malinic. 2. Carbombs with one Mat MacQuarrie. 3. Floored by Drew Gilchrist and his unexpected Signalnoise iPhone skin. Magic. 4. Hell of a nice backstage area to hang in at the venue. Came with with Jack Daniels. 5. The mighty Fabio Sasso and his amazing story/talk. 6. Radim Malinic finally caught up with us, destroyed the stage, and gave me a shirt. Thanks man! 7. Got RAD gifts from Buffalo-correspondent Paul Pants. 8. Ate a fantastic burger and discussed wiener-guns with Kat Gaskin. 9. DESIGN RENEGADE hit the stage. Had a blast. Finally noticed Colin Oakes had his hand up. 10. Poster-seeking mob destroyed my merch table. Huge thanks everyone! 11. Shook hands with Nick Hess, Dave Hardy, Paul Morel, Joseph Cotten and Steve Schiavello. 12. Got an awesome character design gift from Marie-Michelle! 13. Saw Shelby White drop mad wisdom onstage. Profound. Deep. 14. 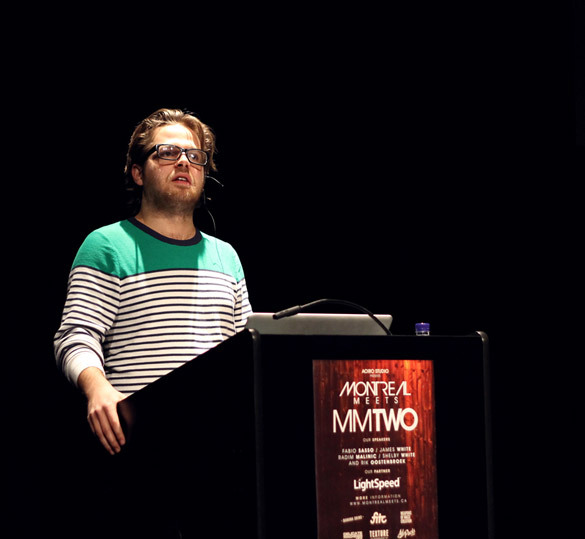 Rik Oostenbroek did his first talk and NAILED it. Amazing work. 15. Shelby and I threw down a big drawing collaboration at Steak & Frites. 16. Paul Pants became an international sensation over dinner. Pants for the People™! 17. Saw Rik open a beer with a lighter, cap hit the ceiling! Jaw-dropping! 18. Did a few doodle requests of Superman, Spider-man, Iron-man and Wolverine. 19. Matt Marshall is from my neck of the woods, travelled to represent Nova Scotia. Pride! 20. The amazing and accomodating Francois Hoang, Thi Alyson and Suzana Manolache made every last detail go off without a hitch. None of this would have been possible without them. Indebted. Standing ovation! I know I’m missing all kinds of details and names in between, but I appreciate everyone for coming out to see the talk. ALL our talks. Killer event and I’m honoured to have been a part of it for the second year in a row. Montreal, you are held in high regard at the Signalnoise HQ. Big thanks to Tina Mailhot-Roberge for the photos above. My sights are now set squarely on YOU, Toronto. 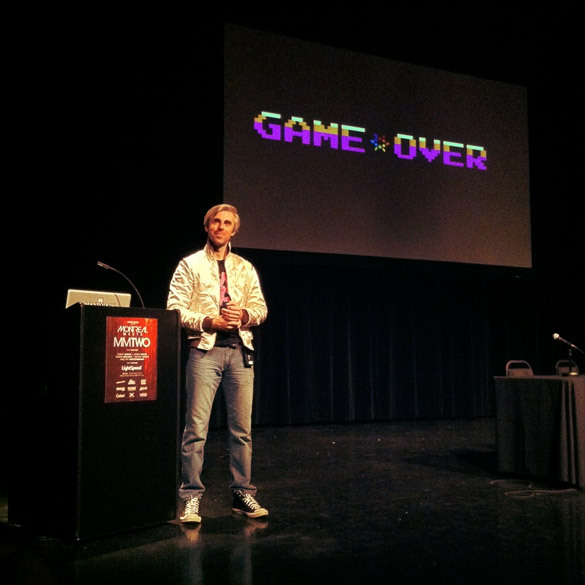 I’ll be bringing DESIGN RENEGADE to the stage at FITC Toronto in a very short 2 weeks. You have been warned. Your talk was amazingly inspiring. Hope to see you again next year! I second that Matt. Sooo worth the trip from Colorado. Great people, great art, great fun. Game over. DESIGN RENEGADE WAS AWESOME! Super inspirational weekend. No doubt, man! It was a life changing weekend for me. 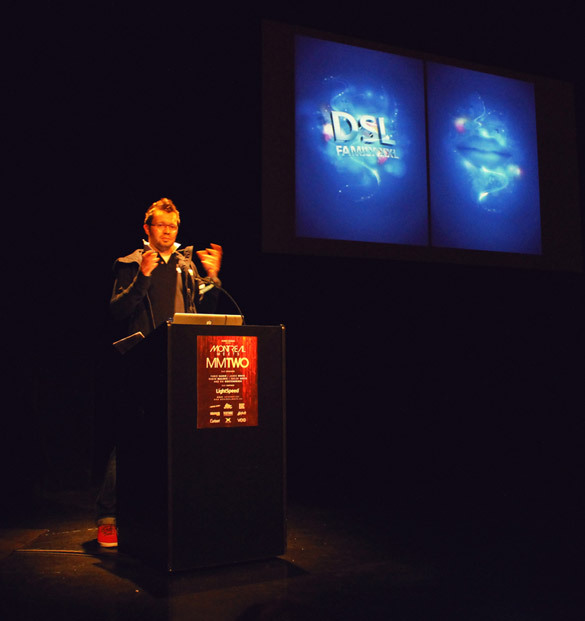 This was my first visit to Canada, and my first design conference — have I been living in a cave? Ha! Loved the Design Renegade presentation man, very inspiring, and I especially appreciated your transparency about your recent shift, and how you’ve rediscovered your passion. I think that resonated with a lot of us. Gosh. So much to say about MMTWO. I also felt honored to be among you all, and I’ll probably fly up from North Carolina again for MM3! The event was such a blast and it was an incredible pleasure to meet you James! It’s a shame, in the end, that we couldn’t do that interview! Maybe next time. I already said it many times but once again: really cool presentation, my favorite of the bunch along with Fabio’s and Radim’s. 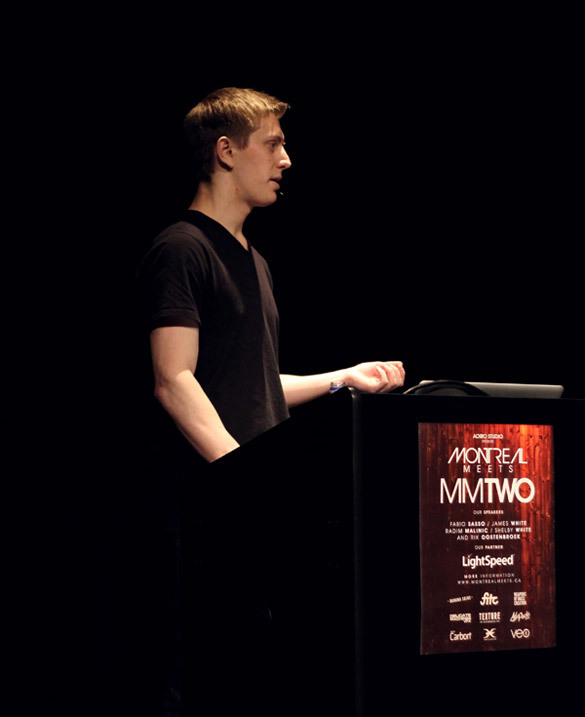 Thanks for coming to Montreal to share your experience and work. Does anyone have a recording of this super duper event? Amazing Event!!! !…One day I will see it in person! !…I really hope to! !…James, you’re great as always!!.. 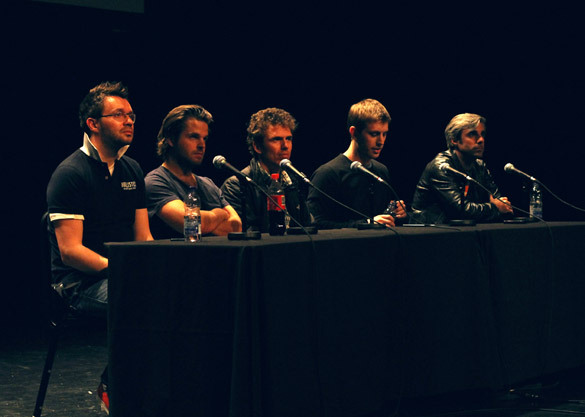 I hope we can see a recorder version of the talks, i can´t afford that kind of travel. See ya! I join Andrey and Jonathan and would also like to see video from this event. The event was originally going to be streamed, but unfortunate server problems happened which killed the plan. Sorry gang. It was an amazing event, indeed. I’m still processing everything! DESIGN RENEGADE was a great presentation, James. You should be proud of it! It’s good to know even the best hit a wall from time to time, and greatness shows through in how you deal with it. Great jacket, by the way.